Does Niagara Falls’ Creepy Recycling Mascot Want Your Trash, or Your Soul? 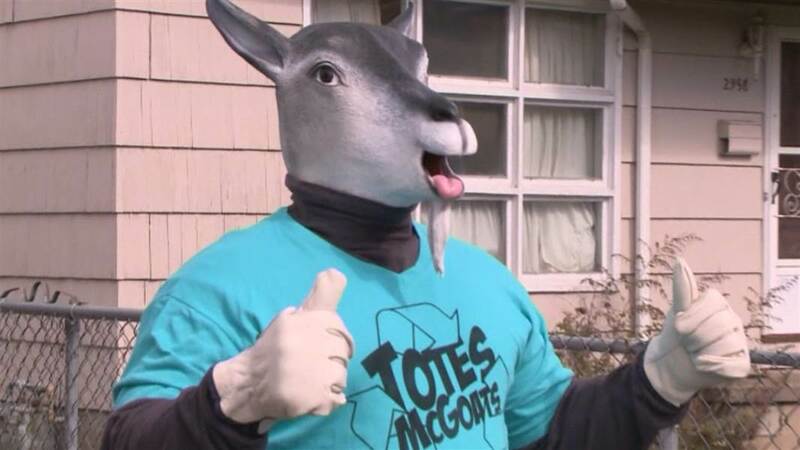 The city of Niagara Falls, N.Y., wanted to get people—particularly millennials—more excited about recycling, so it came up with what it hoped would be a memorable mascot: Totes McGoats, a man in a latex goat mask (available on Amazon) and a blue T-shirt. His name is a play on a phrase Paul Rudd utters when trying (excruciatingly hard) to make a friend in I Love You, Man. The head was perhaps inspired by the online popularity of Archie McPhee's terrifying horse mask, which—like Totes—has also achieved meme status. As for why the city chose a goat man? Presumably, goats like trash. So if you don't recycle, Totes McGoats will murder you in your sleep. Brook F. D'Angelo, coordinator of Niagara Falls Solid Waste Education and Enforcement Team, is responsible for releasing Totes on the world. After he became famous, she joked, "Clearly, I'm a PR and marketing genius." Seriously, though: The budget for the project was just $100, and $60 was spent on the mask. All we know about the man inside is that he is a city worker. Given that goats eat everything, and Goat Island is in the middle of the Niagara Falls, a goat was a shoe-in. "We had hoped for a good reaction, but this is otherworldly," D'Angelo said of the reaction. Still, it goes down as one of the laziest mascot attempts ever. Buy a disturbing Halloween mask online, slap it on some poor city worker, give him a Twitter and call it a day. Since rocketing to internet stardom, Totes mostly retweets press accounts about how terrifying he is, fights with the fake McGoats Twitter account that immediately sprang up to cash in on his cachet. Occasionally, Totes peppers in hashtag-laden messages about recycling. "Totes is a cute animal mascot, kind of scary, actually," Niagara Falls mayor Paul Dyster admitted to Time Warner Cable News. "But having an animal mascot, we think, is one of the ways that you can reach out to kids and get their attention."